Some of my favourite sounds in the woods are the sounds that the raven make. After the raven disappearing almost completely, the forests I go into now have quite a lot of them and on a lucky day you can see 10-15 of them together, although more commonly you see or hear a lone one. 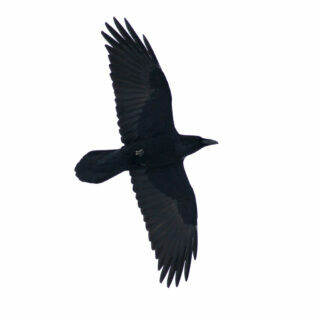 The typical diamond-shaped tail of the raven in flight, as opposed to the rounded tail of the crow. The distinct swoosh sound from the wings also helps you know the difference between the two. You can hear them from quite afar, especially if you are alone and all is quiet. A distinct A fairly slow “swoosh, swoosh, swoosh” from their large wings, a sound unlike what you hear from other birds. Sometimes they also make a dark “crou, crou” and occassionally when flying also simultaneously an odd and constantly shifting, high-pitched & musical squeaking and whistling noise, giving it two voices at the same time. In total they have some 15-30 sounds in their repertoire, used to communicate e.g. warnings, fleeing and hunting commands. Some of these sounds are made through snapping their beaks or even using their wings. They are big, a lot bigger than most people think. An adult raven can be near 70cm tall, beak to tail, with a wingspan of 130cm. They are quite intelligent with good problem solving capacity, and they can mimic sounds, even human voices, which might explain why they have been sacred animals in many cultures around the world. They are known to manipulate other animals, like wolves, to do tasks for them, like opening up carcasses, making it easier for them to feed. They also steal hidden food from other raven, and even make fake secret caches for the same reason, to fool the other raven. Young raven are also unusually playful. They like to steal shiny things and also play games like “catch”, even with other species like wolves who seem to enjoy it as much, and even sliding down snowy slopes, seemingly just for fun. My “thoughts” and “memories”, based off of 7th cent gilted bronze shield fittings from Sweden. In Norse culture the “ramn”, “hrafn” or “ravn” are of course famously associated with Odin, and with Hugin and Munin in later Viking period representing Thought and Memory, the two things needed to make you wise (1). 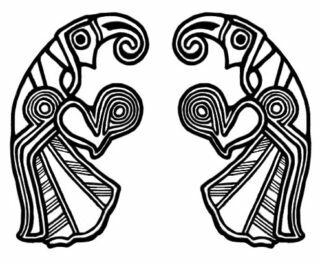 According to Grimnismál Odin always fears that Hugin won’t return, but he is even more concerned that Munin won’t. The raven are excellent at finding food, both hunting and scavenging, but also eating plants, fruits and berries. 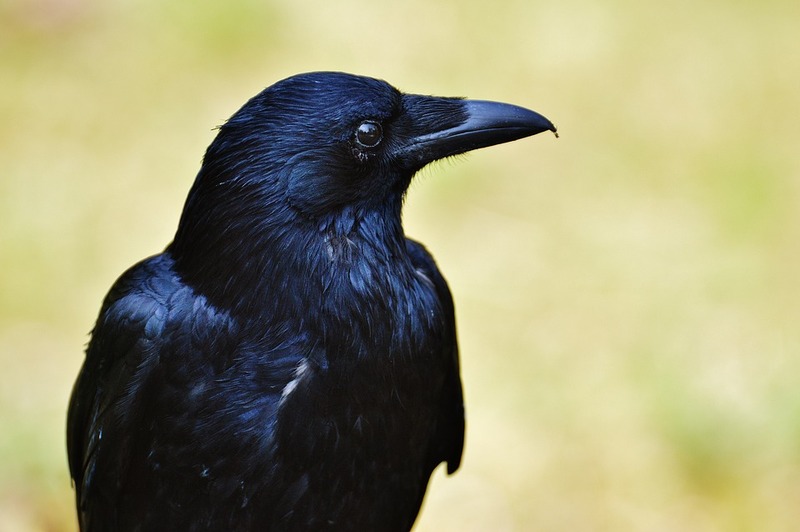 Their capacity for always finding carcasses has given cause to the perception of the raven as exceptional at finding things, a skill that can also be transferred through magic, according to old Sami beliefs (3), as recorded in “Lappish Texts” by Johan and Per Turi (Köpenhamn 1918). Each raven has a magical feather under its wing which can be found by throwing all the feathers of a live raven into a slow stream. The feather that goes against the stream is the right one. Store it for nine days in each of your body’s hairy regions, 3 days for each armpit, 2 days for crotch, then a day and night in the hair of your head, to make it harmless, then let it go in the wind with the words “Come and be my guide when I need it”. After that you will always succeed in finding what you seek. Similarly in the culturally Norse influenced Hebrides, there is a legend tied to Kenneth MacMathan, a man suggested to possibly be of part Norse origin and living in the 1200s. As a baby it is said that before he was given anything else, they fed him blood, or water to drink from a raven’s skull. This gave him wisdom and the powers of prophecy. Another variant tells that it gave him the ability to understand the language of birds. This notion seems to have existed in the Highlands as well. 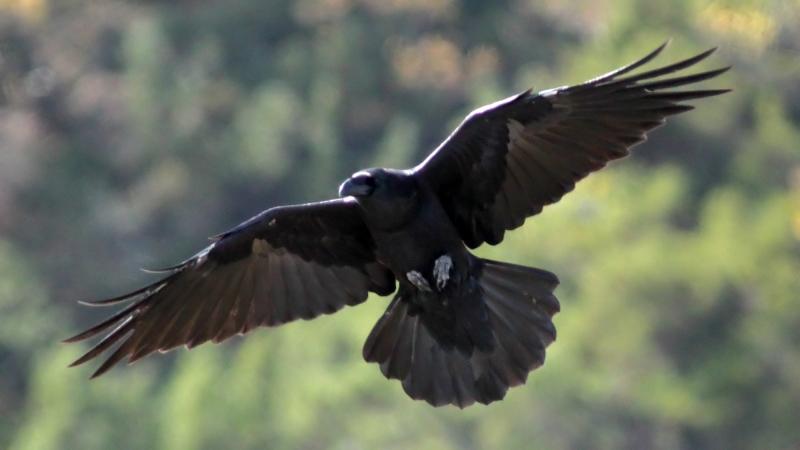 The Nordic raven tend to prefer forests with some open areas nearby, like lakes or coastal areas. In Scandinavia I have never seen them in rural or urban areas. On the other hand, as I go out into the woods I meet them every time. And hearing their wings as they approach and pass over you in the twilight when you are alone in the woods is just breathtaking and magical. For all these reasons, I have two old raven tattooed, one on each arm. 1. Another interpretation is that Hugin and Munin represent “thought”, “will” or “lust” and “intuition” or “desire” respectively, i.e the opposition between conscious logical thought and intuitive feeling or sense and intuition. However, to me that doesn’t really fit with the passage from Grimnismál where Odin fears his raven, his mental faculties, will not “return” some day, and especially fears not having Munin return. It makes more sense that the two things you need to be wise, capacity for great thought and for remembering would be important for him. That said one could of course build a good argument on the idea that desire for learning, life and the world in general would be of as great importance to him. Truth is no one today really knows which one is correct. 3. As a sidenote, the Sami belief system seemingly has connections to parts of the old Norse pantheon with the thunder god Thoragalles/Tiermes/Thoron carrying a hammer, and a World Tree, albeit with a more naturalistic leaning focus, much as the older Nordic belief systems, including a bear cult, an animal also associated with Odin, and the spirit world of the dead. The fact that the Nordic cultures were aware of each other seems obvious when studying contemporary sources and the shamanic Noadi and Seidr seem connected.